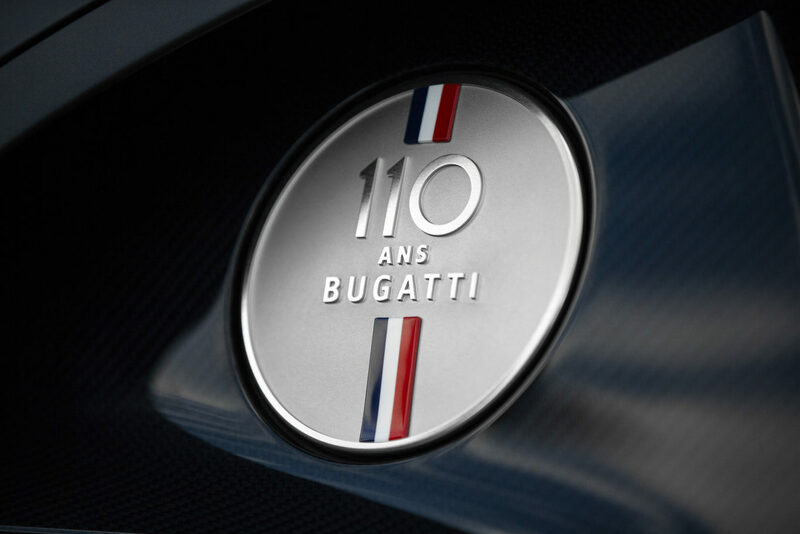 Billed as a ‘tribute to France’ and marking the 110th anniversary of Bugatti’s foundation – ‘110 ans’ is ‘110 years’ in French – the model is limited to just 20 examples and features a range of bespoke touches outside and inside. The car’s colour scheme takes inspiration from the French flag, with red, white and blue applied to many areas of the vehicle. Even the underside of the Chiron’s movable rear wing has been finished à la the Tricolour. Matt black wheels fitted in front of large blue brake callipers complement the overall look of the vehicle, and you’ll find matt ‘Steel Blue’ paint at the rear of the car, too. Inside, tricolour stripes have been applied to the headrests and backrests of the seats, which are finished in two-tone blue leather. Bugatti’s Sky View panoramic glass roof is also fitted as standard. Carbon-fibre has been used on the steering wheel, steering column and seat trims too. A special medallion created from solid silver and enamel has been positioned on a carbon-fibre plate fitted in the centre of the car’s cabin. Even the key has been given a boost – it’s covered in three sewn leather patches in the tricolour shades. Mechanically, the 110 ans Bugatti is identical to the regular Chiron Sport, meaning it uses a quad-turbocharged 8.0-litre W16 engine with 1,479bhp. It’ll crack 0-60mph in less than 2.4 seconds and tops out at 261mph. Prices for the 110 ans Bugatti are yet to be announced.